Well, this is my choice for July. 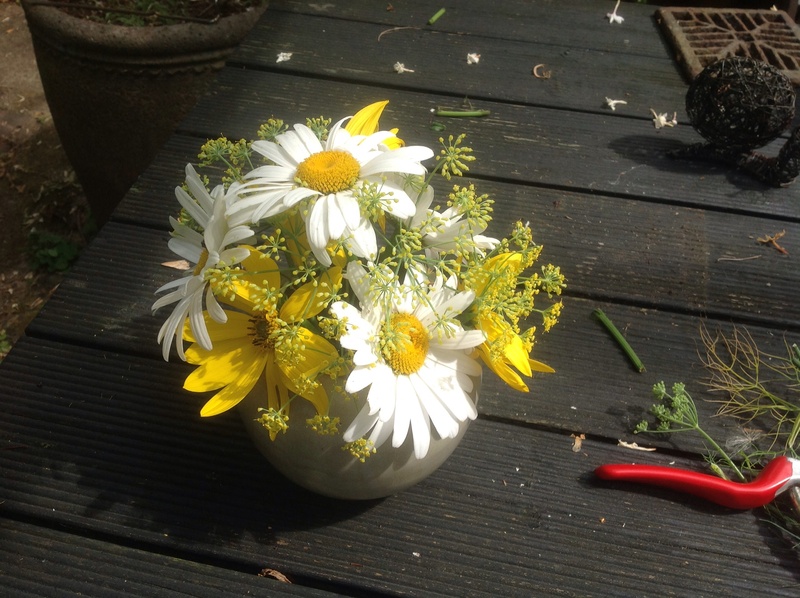 I love vases of daisies indoors – I’ve been known to cut lawn daisies for the house, before now! We have several daisies growing in the garden, but I loved the simplicity of the white Leucanthemum with yellow Helianthus. It’s a combination I’ve used before and considered very cheery! The Heleniums and Echinaceas will have to wait for another time! I don’t know which varieties they are as they were gifts. The blooms are of similar size and the yellow centres of the Leucanthemum is repeated with the yellow of the Helianthus. I chose to cut them short and display them in a round bowl. I then added a few sprigs of fennel as a filler, to soften everything. You may be wondering why I chose to photograph my vase outside, complete with detritus! Apart from it being a novel viewpoint, it was in the process of being admired! Poor little fly! I didn’t relish bringing him indoors, but I didn’t have the heart to shoo him off, while in the middle of his dinner! And now for the competition! I can’t decide if this works or not! It’s certainly “plonked in a vase”! The display needed to be changed, but this was one of our rare wet days. It was soaking wet outside, and was showing no sign of stopping. Much as I can cope with a bit of rain, this was too much to spend time perusing the planting, and anyway, everything would be sopping wet. 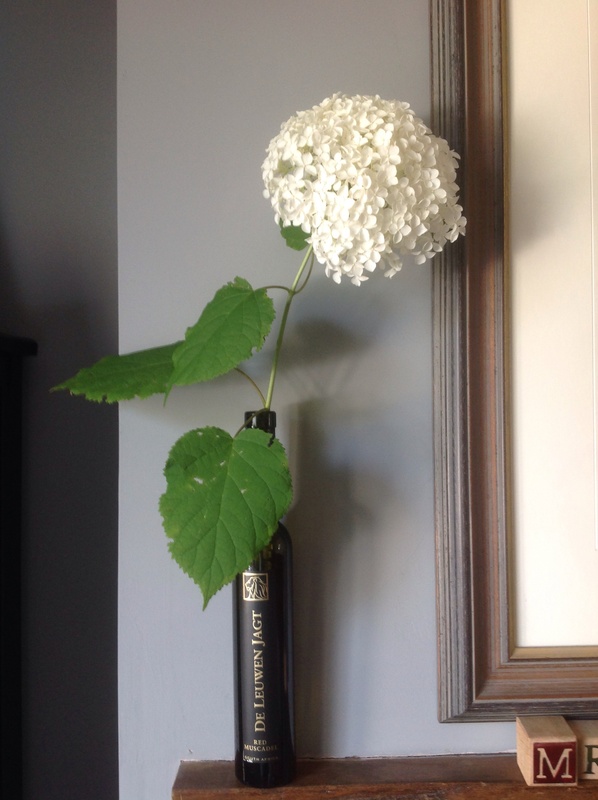 It was a case of what single stem was available that could look good in a vase – a minimalist arrangement this time! Crocosmia “Lucifer”! A striking looking flower, which was perfect at that moment in time. So I dashed out, secateurs in hand. 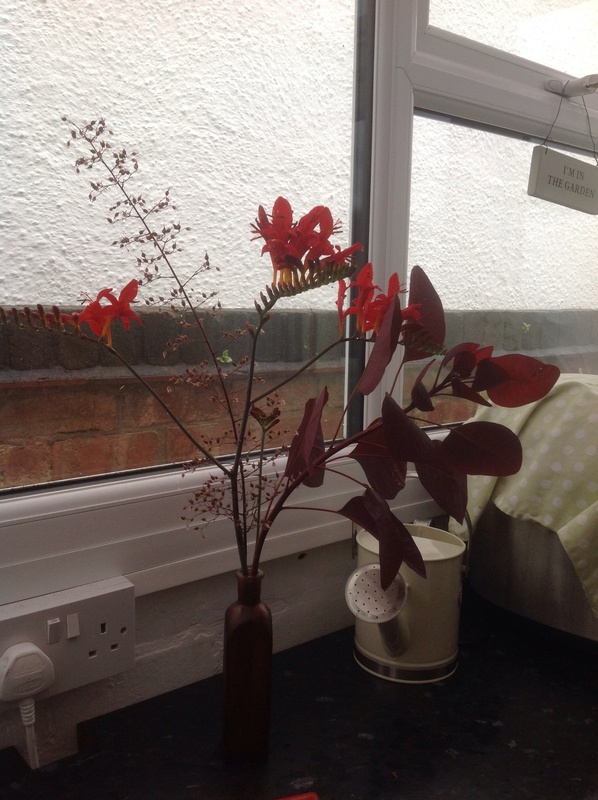 But right by the plant grows Cotinus “Grace”. That would look good with it, so another shoot was cut. Then, while rushing back indoors, I noticed the flower spikes on our Heuchera. They were the same colour range, but with a softer texture. That was it! Back indoors and plonked! An amber bottle provided the plonking vessel. See what you think! 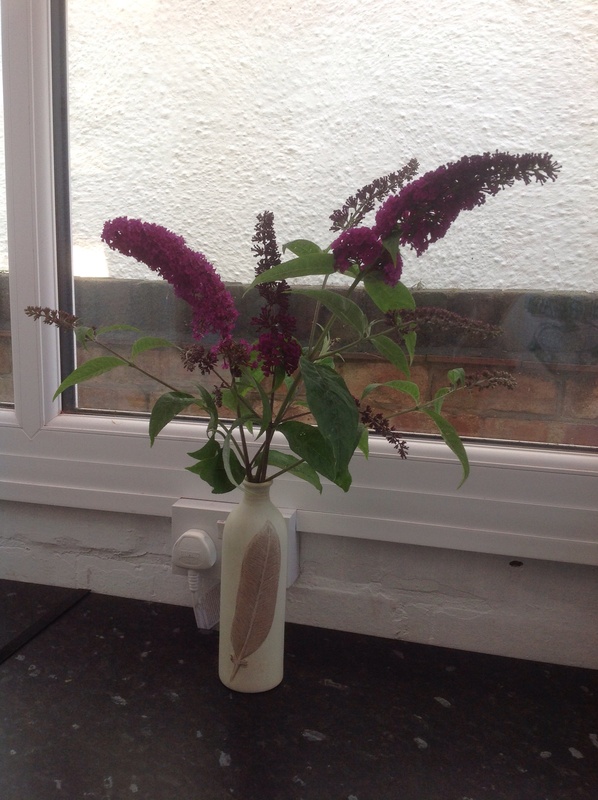 Mr Chef is a fan of buddleja and the butterflies they attract so this is for him! Again, an unknown variety, as it was one of my first successful attempts at propagation. 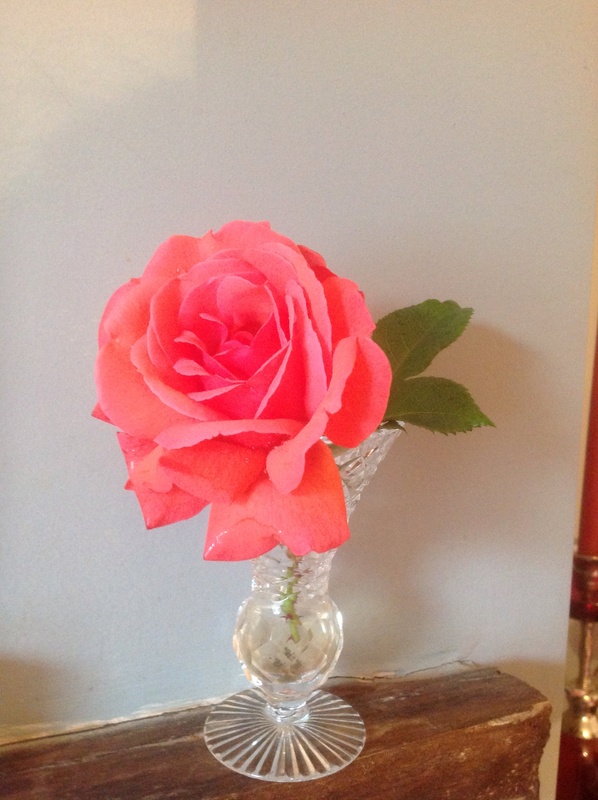 One my grandad’s roses, “Braveheart”. Blooming lovely! “Annabelle” even looks fantastic in an old wine bottle! Last, and certainly not least…. …. the first of my sweet peas. These were seed packets way back in February! Two old fashioned, scented varieties, “Painted Lady” (the pink and white one) and “Matucana” (the darker purple one) They’re going great guns in the garden, so I should have a continuing supply of these scented beauties, for the rest of the summer. I think a small, simple vase is best, with no other floral competition. And, of course, the scent! Simply gorgeous! All very simple displays, this month, for whatever reason, but lovely, nonetheless, I hope you agree! This entry was posted in The Cuttings Calender and tagged Buddleja, Crocosmia "Lucifer", cut flowers, Daisies, Hydrangea "Annabelle", Roses, Sweetpeas on August 8, 2014 by thelonggardenpath. You can’ t beat daisies at this time of the year. It’ s daisy time. I love your posy. You really have got into bringing flowers into the house haven’ t you? But of course you have to keep up with the sweet pea picking. What a joy a posy of these are in the house, the fragrance is wonderful. For a few years now, I’ve always meant to have a continuous display in the house, but have only managed one now and again, and never kept it going. But when I started this blog, I decided to set myself the challenge and so far so good! As for sweet peas, they always take me back to my childhood. My Granny always had rows of them growing in their garden. So far, I’ve not had the same success, but this has been my best attempt yet. I hope for even better, next year! All your vases are very pretty, the daisies are simple but perfect, I must think of using the fennel it adds a lightness which is perfect, and I do have a lot this year! Thank you, Christina. I have used Alchemilla mollis with white daisies in the past, but at this time, it’s gone over. I was looking for an alternative and thought fennel would fit the bill – and it seems to work! 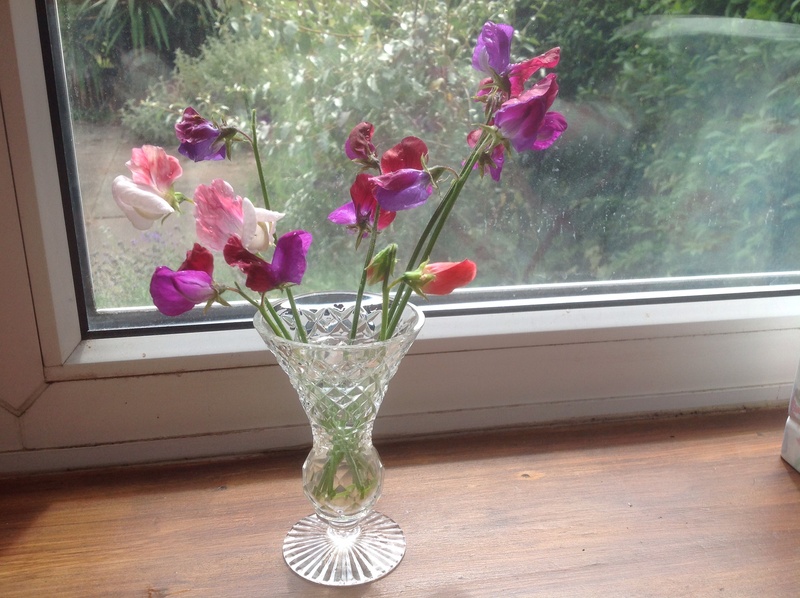 You are doing so much more than just having a vase on Monday, as most of my vases don’t last the week and I am afraid that much of the time they sit in a state of decay for a few days before Monday comes round again – need to remedy that (which I did this week, with sweet peas – much nicer than dead flowers). 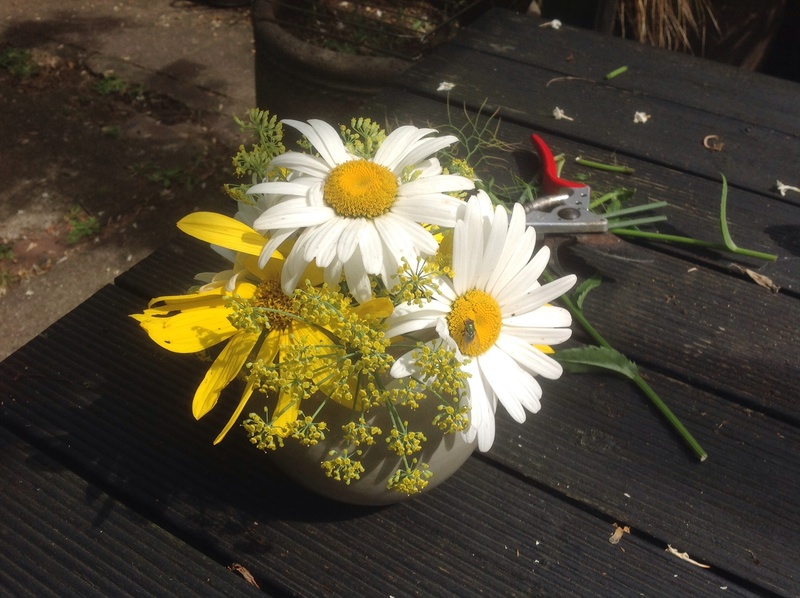 I do like your daisy bowl, but your single blooms also remind us how nice it is to have fresh flowers inside – did you have to weight the bottle down to keep your Annabelle from toppling over?! Thanks, Cathy! I admit that some of my vases are well past their best, too, when they get renewed. Single blooms do make it easier and, hopefully, the sweet peas will fill the gaps and keep things ticking over. The weight of the bottle and the water is enough to support “Annabelle” – she’s surprisingly light for such a large flower head! I admire My Annabelle every time I walk past, so I must bring in the odd single bloom to extend that pleasure. My neighbour grows ‘brave heart’ in memory of her husband, along our adjoining fence, so I get to really enjoy that lovely rose too. What luck! We were saying the other day what a great rose it is. It is growing in a small bed in a somewhat neglected part of the garden, with little attention paid to it, in comparison to the roses in the main border, but it blooms it’s socks off for months on end, and grows so strong and healthy. Maybe that tells me that my other roses are too mollycoddled!